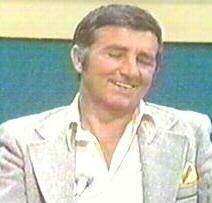 People often ask me, Why do you love Richard Dawson? and I tell them because he's such a nice guy who knows how to make people laugh and feel at ease. A lot of people think my site is overly obsessive, but if you knew me, you'd see it was normal. You can't imagine how long it takes me to arrange the knick knacks on my entertainment centre. There are some people, out there, that are worse than me. Meaning they can't accept the fact that celebrities get married and have families, and they'll probably never meet them. And if they did, it would be a rather awkward situation. The point of me making this site was to let people know a little bit about Richard and all that he's done. 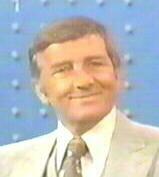 Alot of people only know the name 'Richard Dawson' when you put it with 'the host of Family Feud.' But Richard is much more than that. And this site was made to let people become aware of that. I've tried to express Richard's charm, wit, and humour by putting up a bunch of sounds and quotes. The photos on the site were meant to show people just how FINE he is, hehe. This particular page was made to explain why I have this site, and who it's dedicated to. I'll start out by telling the story, which I've mentioned many times, about how I started liking Richard. It was many years ago, when I first saw "The Running Man." I believe I saw it with my parents when it had just come out. I always liked the bad guys in movies (such as Jack Nicholson as the Joker), so I instantly started rooting for Damon to win. Years passed and I never thought about the movie again for quite some time. About a year ago, we got Digital Cable, and finally had access to Gameshow Network and TvLand. My online friend got me interested in "Family Feud" and it took awhile before it dawned on me that the host was none other than the bad guy from "The Running Man." I never even knew Richard's name back then, and I was shocked to find out he was the same guy. My friend proceeded to tease me a bit once I told her about my crush long ago. 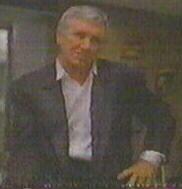 After seeing how funny and sweet Richard was on "Family Feud", I found myself in crush-mode, once again. I started watching him on "Hogan's Heroes", but I would tape it, then fast-forward through everything til I got to the Newkirk parts, and then I'd put those parts on a tape to save. (Since then I've started taping the entire show, and only need a few more to complete my collection.) I loved Richard's accent on "Hogan's Heroes" and was thrilled to find out that he was really from England, since I have a thing for English guys and accents. I also started taping "Match Game" and only taped the Richard parts. (I tape the whole show now though.) It's always nice to see Richard in casual clothes as opposed to the suit she wore on "Family Feud", and it was neat to see him not playing a character. 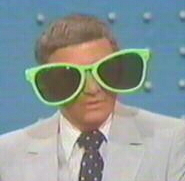 "Match Game '74" remains my favourite year for the show, but '78 ties for second with me. I thought it was interesting to see him doing one show, and then doing another show in the same year. Like seeing two different versions of the same guy. My only regret is that I didn't discover Richard earlier. I could have been watching "Family Feud" in 1994 when he hosted it, but I never noticed it was on. I didn't know whohe was then. And hopefully this website will introduce some people to Richard, so they can catch up on all the great stuff he's done through the years. People may think I made the site because I'm completely obsessed with Richard. I guess it seems like it. There is a lot of weird stuff on my site, but I like weird. When I like or admire something or someone, I try and show my appreciation. I want people to know about Richard, and I want them to remember him. I want people to know just why I like him, and why I spend so much time working on my site. I enjoy doing it, and it makes me happy to know that people are finding the information useful. I know actors are only doing their jobs when they make shows and movies, but some achieve much more than that. There's always those special ones that bring a bunch of happiness into the lives of people, and brighten their days. Richard is a perfect example. The way he makes people feel comfortable. The advice he's been known to give to viewers. How great he is with children. There's a lot of references online about how he was hard to get along with at times. I think everyone is hard to get along with at some time or another. Richard is no different that anyone else for that matter. There's also several comments out there about how he kisses way too many people. Reminds me of getting caught in class with candy, and the teacher said if you don't have enough for everyone, then you shouldn't have it, otherwise it's OK if you share. Well, Richard shared. And he did it equally. And if you ask me, the world needs a little more affection. This one's for you Richard.